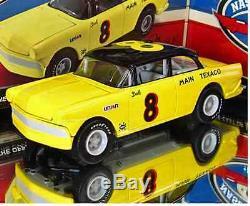 DALE EARNHARDT SR 1956 FORD VICTORIA 1/24 ACTION. 8 1956 Ford Victoria - the Beginning of a Legend Back in 1971, Dale Earnhardt was just getting started. He was years away from being a NASCAR® Champion, and it would be many wins before hed become known as the Intimidator. But with the prodding of Earnhardts father Ralph, a North Carolina car owner named James Miller saw the potential in young Earnhardt and turned his 1956 Ford Victoria over to the unproven driver. It was only the second car Earnhardt ever raced. He was a wild kid back then, said Miller. He didnt win in my car, but he never did get it tore up where we couldnt fix it. Now Lionel NASCAR Collectables is proud to introduce for the very first time the die-cast of the No. 8 1956 Ford Victoria which Earnhardt drove on the dirt tracks of the Carolinas in the GASCAR racing series. Its a diecast that tells the story, that begins the legend, and it has never been available to collectors until now. ACTION FEATURES: This diecast NASCAR collectible features an all Diecast body and chasis; opening hood and trunk; detailed engine and trunk compartments; and more! We have been serving thousands of NASCAR fans online since 1999. We also operate a full-fledged walk-in store located in Gainesville, GA.
We take collecting diecast seriously. The cars we send are mint, unless specifically stated. Your item is brand new- no smoke , no pets, brand new out of a new case. The item "DALE EARNHARDT SR 1956 FORD VICTORIA 1/24 SCALE ACTION NASCAR DIECAST" is in sale since Wednesday, March 27, 2019. This item is in the category "Toys & Hobbies\Diecast & Toy Vehicles\Cars\ Racing, NASCAR\Sport & Touring Cars". The seller is "diecast_dealer" and is located in Gainesville, Georgia. This item can be shipped to United States.